For this research, we collected data from sales leaders, sales managers and front-line sales personnel to better understand the levers of sales execution effectiveness. Respondents completed an online survey covering the areas of customer value, sales process, account management and sales roles. 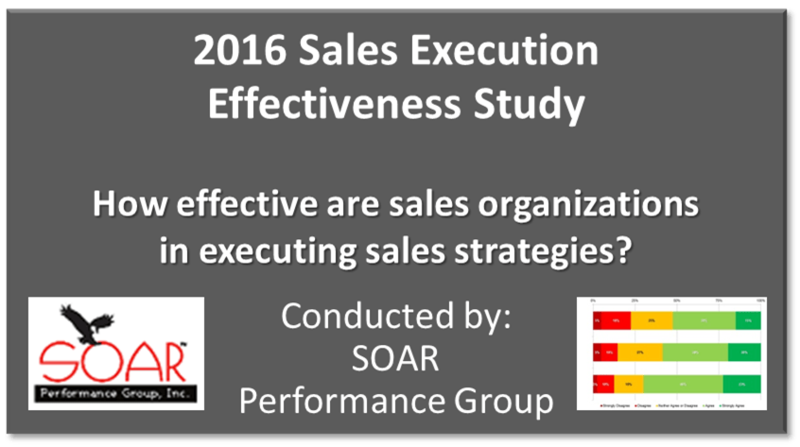 SOAR Performance Group invites you to participate in our Sales Execution Effectiveness Study. 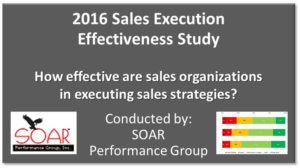 The focus of this study is to provide a benchmark of how effective sales organizations are being in executing their sales strategies. Your responses will be held in the strictest confidence and used to only produce aggregated summaries. There are only 25 questions so it should not take long to complete. In return for completing this survey, we will send you a complimentary copy of the summary findings when the analysis is completed. This summary can help you better benchmark your organization. We further promise that you will not be contacted by any salespeople.